The University of the Philippines College of Music is offering two free concerts as part of its program of teaching the fine art of music and as part of celebrating the festive season. Both concerts are also benefit concerts meant to receive cash donations that will go to UP students from Samar and Leyte whose families were affected by supertyphoon Haiyan (local name: Yolanda). 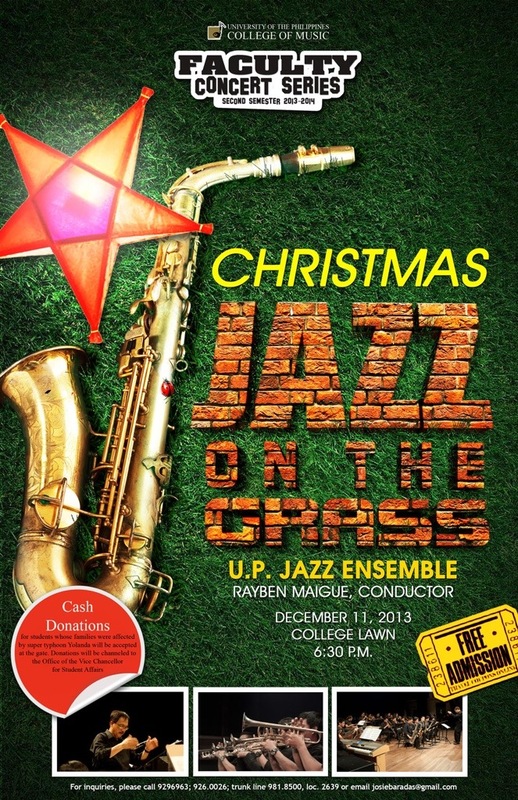 The first concert is dubbed “Christmas Jazz on the Grass” on Wednesday, December 11, 6:30 pm at the UP College of Music lawn and the second event is a musical adaptation of Fr. 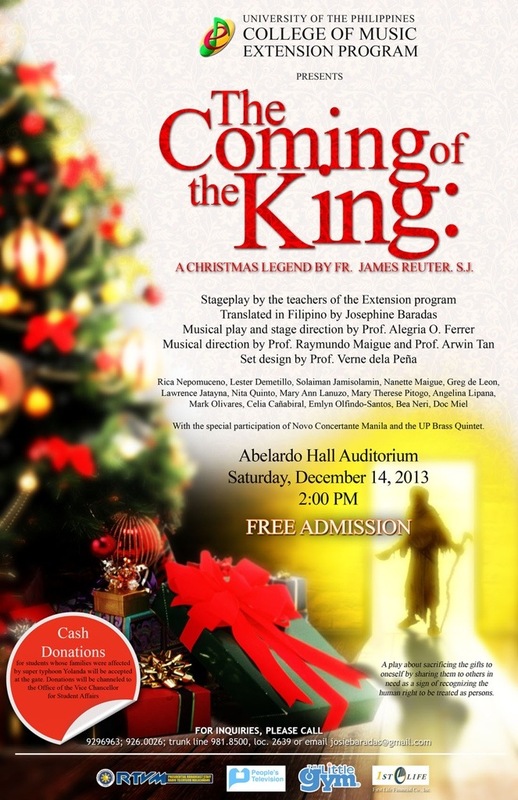 James Reuter’s Christmas play for children titled “The Coming of the King,” which is scheduled on Saturday, December 14, at 2pm in the Abelardo Hall Auditorium. Coots’ “Santa Claus is coming to town.” Lara Maigue and Phoebe Bitoon will render the vocals. The children’s musical is a play about the sacrificing of gifts for oneself by sharing them to others in need as a sign of recognizing the receivers as kapwa tao. Originally the play is a legend made into a children’s play by the Jesuit Fr. James Reuter who passed away last year. Restaging it in the UP College of Music with the artistic directions by Alegria O Ferrer (staging), Raymundo Maigue and Arwin Tan (music), and Verne de la Pena (sets) is an homage to Filipinos known for their strong values for pakikipagkapwa. This play will be interpreted by teachers of the UP College of Music Extension Program such as Greg de Leon, Nanette Maigue, Mary Ann Lanuzo, Therese Pitogo, Angelina Lipana, Mark Olivares, Bea Neri, Celia Canabiral among others with guest singer Elaine Vibal and actress Emlyn Olfindo-Santos. 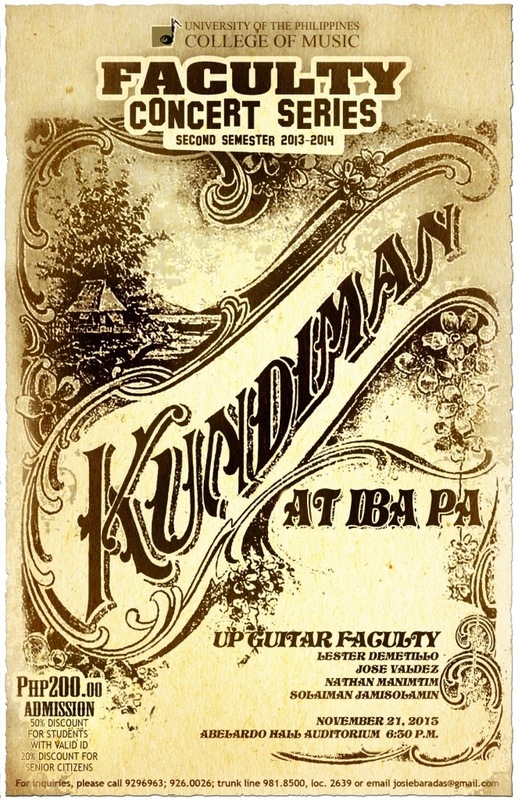 The guitar faculty of the Department of Strings and Chamber Music, University of the Philippines College of Music will present an evening of classical guitar music entitled “Kundiman at Iba Pa” on Thursday, November 21, 6:30 pm at the Abelardo Hall Auditorium. In the concert are the four guitar teachers of the College such as Lester Demetillo, Jose Valdez, Nathan Neil Manimtim, and Solaiman Jamisolamin. They will interpret works by Nicanor Abelardo First Nocturne, Antonio Molina’s Rondo in F Major, Francisco Santiago’s Pakiusap, Julian Balita’s Parang Maghapon Lamang, Ramon Tapales’ Mindanao Orchids, Ernani Cuenco’s Kalesa, Angel Peña’s Iyo Kailan Pa Man, Aga Mayo Butocan’s Binalig and Tidtu A Bagu, Josefino Chino Toledo’s Kal’bit, Ramon Santos’ Abot Tanaw, Augusto Espino’s Improvisasyon, and Jose Valdez’ Philippine Medley. Lester Demetillo and José Valdez are icons in the art of classical guitar playing in the country, while Nathan Neil Manimtim and Solaiman Jamisolamin are young guitar teachers of the College. Nathan Neil Manimtim recently received his master’s degree in music from Illinois State University and is currently the chair of the Department of Strings and Chamber Music. Admission ticket to the November 21 concert is Php200. Students with valid IDs are entitled to 50 percent discount and senior citizens, 20%. For details, please call Josie Baradas at 929-6963 or 981-85-00 loc. 2639.